I hadn’t been active with my blog in a while, but I was so incensed at my poorly coordinated broadband activation by CenturyLink that I posted six articles in rapid succession, ending yesterday with my thoughts about competition. So, from my own personal perspective, the announcement that Comcast would acquire Time Warner Cable struck me as ironic. Some of the early reports seemed to position this acquisition as a fait accompli, which it is not. Most news outlets, ranging from The Wall Street Journal and Bloomberg to The PBS News Hour and National Public Radio, emphasized that the deal would take time, and face regulatory scrutiny. As a point of reference, Comcast’s acquisition of NBC Universal took two years to close. One of my morning calls today (2/14) was with an industry friend in the UK, who asked “What do you think?” From a services perspective, Comcast and TWC serve mutually-exclusive territories, so competition among TV, voice, and broadband providers in any given locality is not likely to change significantly. And although this acqusition would make Comcast more powerful overall, a successful acquisition isn’t likely to reduce the number of voices in the American marketplace of ideas because Time Warner content is not part of the deal. The acquisition is likely to be approved, but I hope that certain conditions are applied. The greatest potential for risk comes with broadband market share. 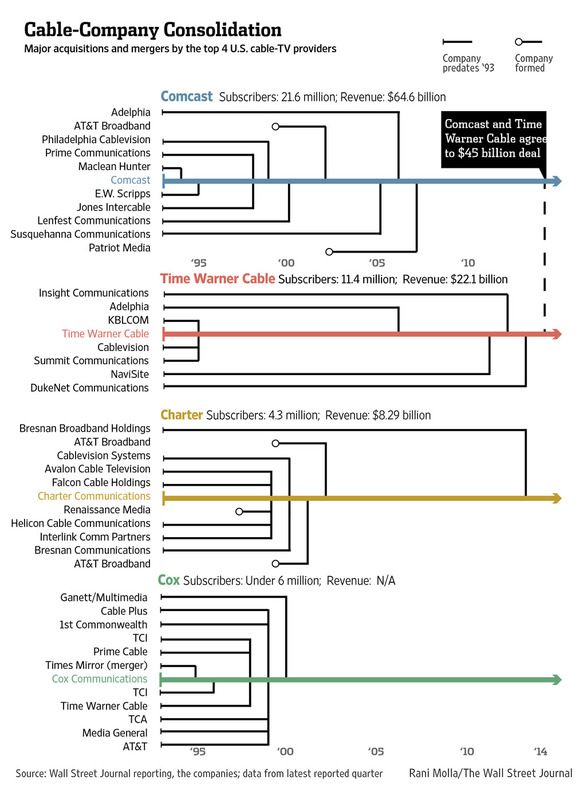 A merged Comcast-TWC would serve nearly 30% of American households. With that kind of market presence, the results can be both good and bad. On the good side, a larger Comcast could conceivably negotiate lower costs from its programming suppliers because the new entity would be reaching the new and higher aggregate number of subscribers (although whether or not such a negotiation would be successful, and whether or not such a savings would then be reflected in the consumer’s bill are both open questions. I do know that my Comcast broadband-only bill was nearly $80/month before I moved out of their service territory this past month, which included ambiguously-defined surcharges). On the other side of the coin, many fear that the company could quietly compromise the quality of over-the-top video services like Netflix with impunity, and ignore or rationalize their way past any challenges to such a practice. Comcast and others have been accused of this practice. (the corollary of that being that, maybe, Hulu would remain at full quality, since Comcast’s NBC Universal is a co-owner in Hulu). But that is an ill-informed point of view (** See below). Just last month, we were reminded of this issue when D.C. Circuit Court of Appeals invalidated the Federal Communications Commission’s 2010 Open Internet Order, which Verizon Communications and others had challenged. A group of US Senators quickly sent a letter to FCC Chairman Tom Wheeler, who is evaluating that situation; urging him to “quickly adopt enforceable rules to prevent the blocking and discrimination of Internet traffic… (and) withstand judicial scrutiny.” Mr. Wheeler says that he will try. US Senator Ed Markey (D-Massachusetts) introduced a bill to keep Net Neutrality in effect until this evaluation is complete. Internet advocates have differing opinions as to whether or not Net Neutrality will stand. The Electronic Frontier Foundation is pessimistic, while Freepress thinks the FCC can preserve it. I personally believe that Net Neutrality is as basic as universal telephone service or the availability of electricity, or law enforcement, or fire prevention: available to all, without bias. One of the FCC’s conditions in the Comcast NBC Universal acquisition was for Comcast to maintain a practice not to discriminate against online video programmers, and to add ten independently-owned programming channels to its cable lineup over the 8 years following the acquistion. But what happens after 2018, when the non-discrimination period expires? Will Internet access speeds be intentionally limited for streams of IP video programming that originate outside of a Comcast headend? Will independent programmers find themselves shut out? Comcast has many friends in the US Congress, and contributed more than $853,000 to members of the Subcommittee on Communications and Technology in the US House of Representatives between 2001 and 2012. If only just to quell the fears of the paranoid, I would propose that FCC Chairman Wheeler take two steps: first, make the non-discrimination clauses of the FCC’s conditions to Comcast from the NBC Universal acquisition permanent as a condition of a Comcast – Time Warner acquisition. Second, extend those conditions to all service providers. The FCC could reclassify broadband as a Common Carrier service, obligating Comcast and all other operators to carry any traffic on their networks or face legal action. As remote as the FCC may seem to average mortals, anyone can submit comments to the FCC about this issue (and select “09-191 Preserving the Open Internet” from the drop-down menu). On the other hand, it’s best to keep emotions at a minimum: fear that the sky is falling is probably misplaced. The above-linked Wall Street Journal article on the acquisition provides a detailed timeline of consolidation in the cable industry, and the Columbia Journalism Review maintains Who Owns What, to track the holdings of major media companies. ** Edited February 25: Netflix will in fact be paying Comcast to guarantee QoS/QoE over Comcast’s network. If the intent were to collude in order to raise prices to the consumer, it would be a terrible precedent and probably found to be illegal. But that fear is not grounded in realities of OTT delivery, because paying Comcast or any other access provider for transport on their networks is a common practice, and is more likely reduce the content providers’ transport costs, not raise them. Pay TV operators with broadband services have always positioned OTT video providers as freeloaders on their networks, but that positioning is disingenuous because paid transport at a wholesale level is a common practice and a revenue stream. See Dan Rayburn’s recent posts for the best characterization that I’ve seen to date. Next articleIs Apple’s CarPlay really the catalyst to bring the Connected Car mainstream?